The views are grand, the lifestyle simple and there are no limits on your Alaskan adventure. Mat-Su, Alaska has it all for your Alaska vacation! 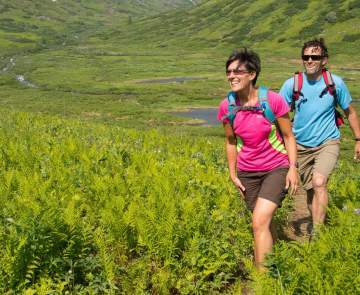 Towering mountains, huge glacier valleys, fish-filled rivers and lakes, abundant Alaska wildlife, glorious hiking country, scenic camping and quaint frontier communities at the Mat-Su is what Alaska visitors dream about. Located approximately 45 miles north of Anchorage, the Mat-Su is ideally located for everything from day trips to your entire Alaska vacation. A fertile farmland that was settled by families from the Midwest as part of the New Deal relief program in 1935. Tour Palmer to discover the history of the earliest "settlers" and discover the legendary, gigantic vegetables at the Alaska State fair in August. Visitors can learn from the Iditarod champs what it takes to complete the "Last Great Race" at the area&apos;s local dog kennels. Further North in Talkeetna - known as the staging site for climbers as they begin their trip up Denali. Flight seeing tours of the mountain are a local specialty. On clear days, Denali State Park offers beautiful views of Denali, North America&apos;s highest peak. A 50 mile scenic loop between the George Parks and Glenn Highways takes you to Hatcher Pass and the Independence Mine State Historical Park. Visit the park&apos;s interpretive center and equipment in the old gold mines. WHAT&apos;S ON YOUR ALASKA MUST-SEE, MUST-DO LIST? Raft or kayak 500 river miles deemed "Exceptional Recreation Rivers"
Take a hike! There are more than 2,000 miles of trails to choose from!